Everyone in the mall agrees. “Bränt” you little tryhard you. 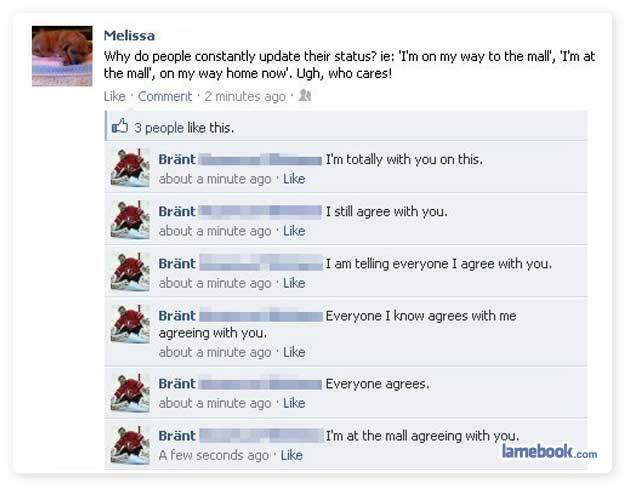 ^I agree with you that Brant is a self-submitter. that’s why you just hide their name from showing up on your feed or you get off facebook and live normally. Sometimes, at work, I feel like I have to update all of my coworkers and bosses of everything I am currently working on every minute of every day. I wonder if there’s an app for that. I love that trying hard at anything is frowned upon by the net. It’s SO true. I am a diehard try–hard. Mukhairy, please teach me the ways of your people.